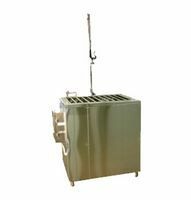 The bedding disposal workstation provides operator and environmental protection from animal allergen. Allows the work surface height to be adjusted to user preference therefore minimizing strain during repetitive operations. Room air is drawn in across the front of the cabinet with an average velocity of 0.35 m/s (70 fpm). 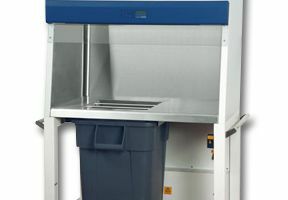 Air is drawn up through the cabinet’s work zone and forced through the ULPA filter (>99.999% typical efficiency for 0.1 to 0.3 micron sized particles). 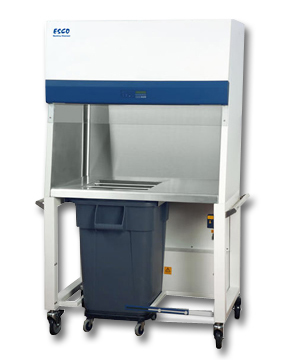 The full work zone ceiling extraction system ensures airflow uniformity throughout the cabinet’s main chamber. The ULPA filtered air then returns to the laboratory stripped of all airborne contaminants and odor. 40.9" x 26.8" x 23.4"
Work Surface Height 36.2" ~ 48.2"